It is Independence Day here in the United States and that is all the excuse I need for this special Flashback column, which takes us back to 2015 to tell the story of how, in very different ways, the U.S. and Canadian governments almost destroyed their respective wine industries. My friends always tell me to have a fifth for the Fourth, and I assume they are recommending a bottle of American wine with the required holiday menu of hot dogs, hamburgers and salads. Cheers and Happy Independence Day. This is more than the simple Adam Smith “laissez-faire” idea. Anderson’s book clearly demonstrates the law of unintended consequences — how well-meaning government policies sometimes have had unexpectedly negative side-effects. No wonder he recommends a cautious approach to wine and grape policy. I was reminded of this when I was researching the history of the Canadian wine industry for a recent speaking engagement in Ontario. I was struck by Canada’s experience with Prohibition in the 20th century, how it differed from the U.S. experiment, and how both ended up crippling their wine industries but in very different ways. Here’s what I learned. The great experiment in Prohibition in the United States started in 1920 and lasted until 1933. The 18th Amendment outlawed the manufacture, sale or transport of intoxicating beverages, including wine. Most people assume that the wine industry collapsed as legal wine sales and consumption fell and this is partly true but not the complete story. Commercial wine production almost disappeared, but wine consumption actually boomed. How is this possible? There were three loopholes in the wine regulations outlined in the Volstead Act. Wine could still be produced and sold for medical purposes (prescription wine?) and also for use in religious services (sacramental wine). This kept a few wineries in business but does not account for the consumption boom, which is due to the third loophole: households were allowed to make up to 200 gallons of wine per year for “non-intoxicating” family consumption. Demand for wine grapes exploded as home winemaking increased (but not always for strictly non-intoxicating purposes). Total U.S. vineyard area just about doubled between 1919 and 1926! But the new plantings were not delicate varieties that commercial producers might have chosen but rather grapes chosen for their high yields, strong alcohol potential and ability to survive shipping to eastern markets. Thus did Prohibition increase wine consumption in the U.S. but it also corrupted the product by turning over wine-making from trained professionals to enthusiastic amateurs working in often unsanitary conditions. The home-produced wine sometimes had little in common with pre-Prohibition commercial products except its alcoholic content. Prohibition started earlier (1916) and ended earlier (1927) in Canada and took a different fundamental form. With support from temperance groups, consumption of beer and spirits (Canada’s first choice alcoholic drinks) was banned as part of war policy with the stated intent of preserving grain supplies for vital military uses. Consumption was forbidden, but production of beer and spirits was still allowed for export, which accounts for the boom in bootleg Canadian whiskey in the U.S. in the 1920s. Neither production nor consumption of wine was included in Canada’s ban on alcohol, although wine sales were limited to the cellar door. What made wine different? Maybe grapes were not as vital to the war effort as grains, although John Schreiner cites the political influence of the United Farmer’s Party in his account of this period in The Wines of Canada. Wine became the legal alcoholic beverage of choice for Canadian consumers and production boomed. By the end of Canadian Prohibition there were 57 licensed wineries in Ontario (up from just 12) to serve the big Toronto market. Wine sales increased 100-fold, according to Schreiner, but “It would be charitable to describe the quality of the wines being made in Ontario during this period as variable,” he writes. The market wanted alcohol and set a low standard of quality, which many producers pragmatically stooped to satisfy. No wonder wine production collapsed at the end of Prohibition as consumers went back to spirits and beer. Thus did government policy in both Canada and the United States create wine booms during their respective Prohibition eras, but the worst kind of booms: bad wine booms. Quality suffered as quantity surged. It is no surprise that consumers turned away from wine once other beverages were available. It took decades for these industries to recover. Both the Canadian and U.S. wine industries are vibrant and growing today, having recovered from the crippling effects of poor quality wine. But they both are still hampered by other policies — especially regarding distribution and sales — that date back to the end of Prohibition. Economic policies can obviously have unintended effects and the shadows they cast can be long indeed. No wonder Kym Anderson is skeptical about government interference in the Australian industry. Prohibition is an extreme case, to be sure, but such cases clearly show the unintended consequence potential that exists even with other seemingly harmless proposals. A cautious approach makes sense. Last week’s column looked back to the concerns about terroir and geographical designations a few years ago when Sue and I visited New Zealand to gather material for my book about globalization, Globaloney. There was frustration and anxiety about how to delimit the Kiwi vineyards and concern that things weren’t moving fast enough. The people in Hawkes Bay were so frustrated that they took matters in their own hands, creating and trademarking the Gimblett Gravels region! Well, the good news is that progress is at last about to be made on the policy front although the promise of progress hasn’t stopped winemakers from trying to speed things along through their own branding strategies. Here’s a quick report. 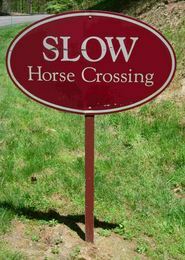 My friend Woody says that justice rides a slow horse and, if that’s true, then the new Kiwi geographical indicator policy must be just indeed. It certainly has been slow in coming! I was struck by a recent Decanter article about New Zealand geographical indicators for wine. “Ministers said …that they would put into practice the Geographical Indications (Wine and Spirits) Registration Act – first passed as long ago as 2006 but yet to enter into force.” The reason for the rush to get the law implemented is a concern over international competitiveness. ‘The act will set up a registration scheme for wine and spirit geographical indications, similar to the trademark registration scheme,’ said New Zealand Trade Minister Tim Groser. ‘Being able to register wines and spirits geographical indications here will make it easier for their users to enforce them in New Zealand. Since the New Zealand industry is very dependent on exports, it makes good sense to bring Kiwi practices into line with the global rules of the game. The move was ‘warmly welcomed’ by generic body New Zealand Winegrowers, whose CEO Philip Gregan said: ‘It will equip the industry with the tools to protect its premium brand from misappropriation or misuse, as well as help secure market access in some regions. A Bill to amend the Act will be introduced to New Zealand’s Parliament later this year, and the Act is expected to be passed by the end of 2015. Paul Goldsmith, New Zealand’s Commerce and Consumer Affairs Minister, noted that some consumers are prepared to pay a significant premium for wines from certain New Zealand geographic regions. “The reputation of New Zealand wines must be jealously guarded if we are to continue growing our wine exports. Good idea. But what took so long? I found an analysis of the situation on the Baldwins intellectual property law website which provided useful background. Apparently passing the geographic indicator act back in 2006 wasn’t enough — it is also necessary for the Governor General to issue an Order in Council, which was not done (as was the case with a previous geographical indicator act from 1994). I have not been following this situation, so perhaps there have been very good reasons for the long delay in implementing the GI act. As I noted last week, some think that it might be premature to set down strict boundaries or worry that appellations in general have gotten out of control. But clearly the NZ wine export sector’s needs are now being given priority. With a little luck they can begin to use the new system next year. Slow justice I suppose. I’d appreciate comments from those in New Zealand who are directly affected by the change. Are there issues here that don’t show up in the news stories? I hope the geographical indicator law, when it is finally implemented, will provide New Zealand producers with the protections and processes that they need. But in the meantime terroir grows in importance every day in the global market as upscale consumers look for markers of integrity and authenticity in everything they buy. Wines of origin designations don’t guarantee these qualities, but they are a way to signal intent to buyers. Smart Kiwi producers are doing their best to exploit terroir both in bottle and as brands, a fact that was clear when we were invited to participate in a digital wine tasting of Marlborough Sauvignon Blanc organized by Pernod Ricard’s Brancott Estate. Brancott Estate is the pioneer Marlborough Sauvignon Blanc producer. 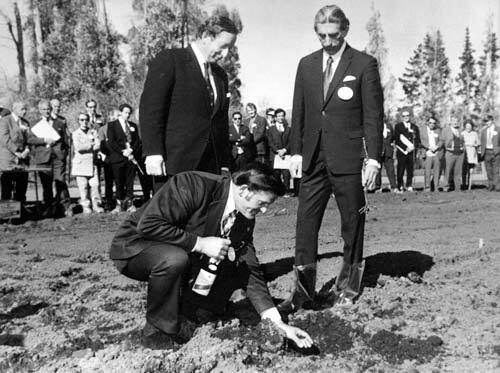 The photo at right shows Frank Yukich planting the first Marlborough Sauvignon Blanc vine at the Brancott vineyard in Marlborough in 1975. If you look closely you can see he is “fertilizing” the vine with a silver coin and irrigating it with Champagne. The Yukich family’s company, Montana Wines, eventually changed hands and current owner Pernod Ricard rebranded it globally as Brancott Estate a few years ago. I suppose the Montana brand wine was never going to be an easy sell here in the U.S. where a wine from Montana can have more than one meaning, but Brancott Estate is a hit, hence our digital tasting. There were five wines in the tasting flight, starting with a low alcohol Sauvignon Blanc called Flight Song and moving on to the mainstream Brancott Estate wine that is widely distributed here in the U.S. Then we climbed up the wine ladder from Stoneleigh Latitude (Stoneleigh is a sister winery to Brancott) to Brancott Estate Letter Series and ending with the Brancott Estate Chosen Rows (tiny production — not currently available in the U.S. market). We tasted the wines in the company of Sue’s parents Mike and Gert with Brancott winemaker Patrick Materman as our virtual guide via a web link. The low alcohol Flight Song, made from early-harvest grapes, was not a favorite, but the popular Brancott Estate bottling was well received with its classic Marlborough flavors and aromas. A good reference point for the wines that followed. The Stoneleigh Latitude Sauvignon Blanc is made from vines planted in Marlborough’s “Golden Mile,” where river rocks carpet the vineyard floor capturing the sun’s heat. Stoneleigh focuses exclusively on wines made from this one vineyard area. This wine, my favorite of the flight, displayed unexpected minerality on first taste and rich fruit when re-tasted an hour later and then the next day. The Letter Series wine came exclusively from vines in the original Brancott vineyard (and not a regional blend) while the Chosen Rows (my second favorite) was sourced from a selection of the best rows of vines from Brancott. It was noticeably more serious and elegant — and more expensive. 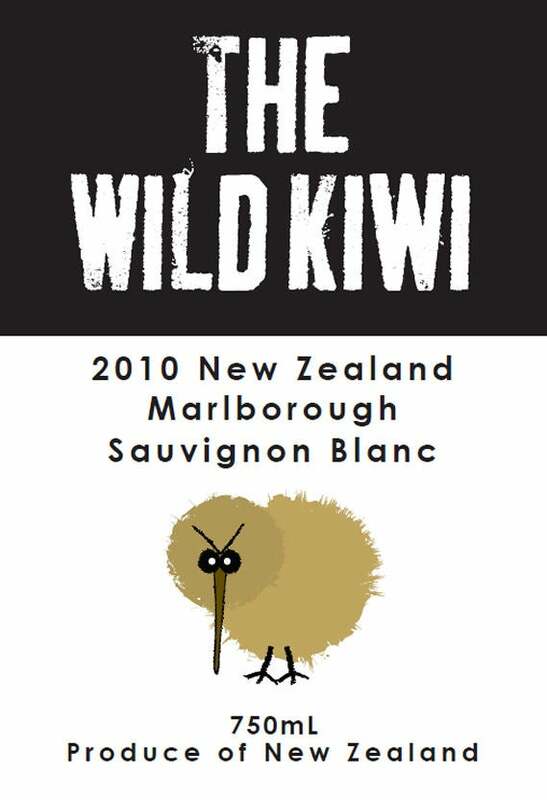 It’s s shame that it is made is such limited quantities because it might change some minds about Marlborough Sauvignon Blanc. I hope I have an opportunity to taste it again. Together these wines demonstrated, just in case anyone had doubts, that Marlborough’s particular terroirs show themselves in the wines and that Pernod Ricard and the Brancott team are committed to making these wines and telling terroirist stories to go with them. Focusing on the vineyard level with a particular brand isn’t the only way to tell the story, but it’s one way to do it until a more formal system of geographic indicators is in place. And even when sub-regional designations are improved, the vineyard-level story will be powerful and relevant. The time is ripe for a terroirist take on New Zealand wines and producers are ready to rock and roll. Here is a march to accompany the [slow] implementation of the New Zealand legislation. Perhaps you have heard it before? You can read more about both the Australian booms and busts and also Prohibition in the United States in chapter 6 of my 2013 book Extreme Wine. Look for a review of Kym Anderson’s book in an upcoming Wine Economist column. We were in Northern California a few weeks ago and decided to try to break away from the strong gravitational pull of Napa Valley to explore the terroir away from the Highway 29 corridor. We were looking for wines that could capture a sense of place — and we found them — but we also stumbled on an exciting wine-food-tourism cluster called The Barlow hidden in plain sight in Sebastopol, just off Highway 12 west of Santa Rosa. Lots of interesting wine economics on display! Here is a rambling report of our trip. Our terroirist tour took us first to Pride Mountain, a fascinating winery located high on Spring Mountain (Pride is the family name of the owners). Some of the vineyards are on the Napa side of the AVA border and some are on the Sonoma side — the labels tell you the percentages of each. Interestingly, to meet certain fiscal rules, there are actually two wineries — one in Napa and the other in Sonoma with a line in the concrete crush pad to separate them. The wines are blended only after they’ve first been accounted for in their home AVA. Wonderful tour, very interesting wines, beautiful location and bizarre regulations! Once across the mountains in Sonoma we headed for DeLoach and Gary Farrell, where we tasted a number of single-vineyard Pinot Noirs. Both these wineries have changed ownership in the course of their existence — brands change hands frequently these days — and both seem to be in good hands now. Boisset has converted the DeLoach estate vineyard to biodynamic viticulture. Gary Farrell has no vineyards of its own, but sources grapes from a number of excellent growers. We had one more stop on our list: MacPhail wines, another terroirist Pinot producer. The wines were wonderful, but they weren’t all that we discovered. MacPhail Family Wines has a roundabout history. It started when the people at Hess Family Wineries decided they wanted to develop a brand to highlight single vineyard California Pinot Noir. Hess President Tom Selfridge asked grower Jim Pratt to handle the vineyard side of things and to recommend a winemaker, who turned out to be James MacPhail. For a while the Hess wines, produced under the Sequana brand, and MacPhail’s own wines were made in MacPhail’s Healdsburg facility. Eventually it became clear that the two projects — MacPhail’s own and his wines for Hess — were going in the same direction, so Hess put its backing into the MacPhail label. The wines, mainly from the Green Valley and Russian River Valley areas (with one wine sourced from the Santa Lucia Highlands down south) had a real sense of time and place. Our favorite was the 2012 Toulouse Vineyard Pinot Noir from the Anderson Valley. Delicious! Based on what we learned at MacPhail on this trip and our stop at Glen Carlou in South Africa in January, I’d say that Hess does an exceptional job of using the resources of a large company to unleash terroirist potential on a smaller scale. Hess makes wine on four continents — soon to be just three when they complete the sale of Peter Lehmann to the Casella family of Yellow Tail fame. Hess and MacPhail were looking for a site for a tasting room facility when they learned of The Barlow project in nearby Sebastopol. Located at a crossroads on the site of an old apple processing facility (Sonoma is almost as famous for apples as for wine in some circles), The Barlow was conceived as a wine-food-arts cluster in a series of cannery-style buildings. It’s a farm-to-fork and grape-to-glass kind of vibe rendered even more authentic by the agricultural heritage of the place. Cult Pinot maker Kosta Browne (now owned by the same people who operate Gary Farrell, The Vincraft Group) was one of the anchor tenants of the project, with the winery spread over three buildings. La Follette’s tasting room is located here as well as the MacPhail Tasting Lounge. The Barlow project also includes a craft brewery and a distillery (now they need a cider maker, don’t you think?). There are shops, a market, street fairs and a number of eateries. We were particularly impressed by Zazu Kitchen + Farm, which is a sort of temple to pork products and local wines, featuring products from Black Pig Meat Company. Do pork and Pinot make a good pair? Oh, yes! How do you use wine to revitalize a run down area? How do you use wine tourism as a tool of economic development? These are questions that I am asked fairly frequently. The Barlow shows one approach that, while not easily replicated everywhere can still provide lessons. The first key is the cluster approach used here. Not one winery but three, building some critical mass The second is that it’s not just wine, but wine, food, art and so forth. The third is that while these experiences can be designed and created, they should not be manufactured — an element of authenticity is surely needed. Each of The Barlow’s tenants– including MacPhail and Zazu — has the quality to stand on its own, but like a good wine blend the whole of the community that has been created is greater than the sum of its parts. As you can tell, our Napa-Sonoma visit was a success. We found the terroirist wines we were looking for and we found something more in The Barlow. Thanks to the people at Pride Mountain, Gary Farrell, DeLoach and MacPhail for their hospitality. Thanks as well to my former student Grant who welcomed us at the Adobe Road winery tasting room on Sonoma square. We loved their distinctive wines, including especially the Kemp Vineyard Dry Creek Valley Viognier. Special thanks to Lowell, Dorothy, Allan, PJ and Holden for their assistance. Disintermediation was a hot topic in financial economics a few years ago — I built an entire economics class around it — and it remains a powerful idea even if it may be an unfamiliar word. I think we don’t use the term so much these days because the concept is now woven into the fabric of our daily lives! Time to untangle it and see how it works, especially in the wine business. 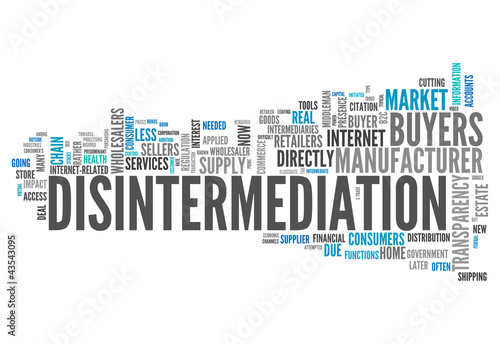 Disintermediation refers to the process of “cutting out the middle man” — reducing the number of links in the supply chain by eliminating certain functions. If you’ve ever tried to sell a home yourself rather than using a real estate agent “intermediary” or bought or sold anything on eBay or Craig’s List then you’ve been part of the disintermediation movement to a certain extent. As the video above suggests, the quotidian activity of buying an airline ticket was once upon a time a middleman business. Not so much any more! Commercial banks were the main focus of financial disintermediation back in the day. Banks and other financial intermediaries provided valuable services (that’s how middlemen earn their pay), but the incentive to borrow or lend directly through “securitized” products was strong and that’s why financial disintermediation started to occur. Disintermediation increased the apparent efficiency of the financial markets but also probably increased risk and volatility because some of the functions of the intermediaries were lost and the bank-based regulatory structure found it difficult to cope with the “non-bank banks” and other institutions that evolved. Or at least that’s my take on how the process unfolded. Disintermediation still goes on today, but it has become so commonplace that we don’t give it much attention — until we are the links cut out of the chain! The advent of “crowd-sourcing” or “crowd-funding” websites is a good example of disintermediation. There are all sorts of ways to shorten the supply chain, both when it is a good idea and when it is not (sometimes it turns out the missing link was really important). How Does This Relate to Wine? Which brings us (finally) to wine. A Wine Economist reader writes to suggest disintermediation as a topic for a column and I think it is a great idea. There are a lot of big and little examples of disintermediation at work in the wine industry. On the big end of the scale we have giant firms like Tesco who now often source bulk wines directly from around the world and bottle them under their own labels (sometimes in their own plants) and sell them under house brand labels. The streamlined process shortens the chain and cuts cost. Disintermediation was part of the story for one of American wine’s biggest success stories of recent years — Two Buck Chuck (a.k.a. the Charles Shaw wine sold at Trader Joe’s stores). Most wine in America goes through the three-tier distribution system with its built-in middleman structure. But Bronco Wine, which makes 5 million cases of Two Buck Chuck a year, and Trader Joe’s took advantage of a provision in California regulations that allowed companies like Bronco to deliver directly to the retailer, cutting out a link and making it possible to profitably sell a two dollar wine. A lot of factors contributed to Two Buck Chuck’s success and this disintermediation was one of them. Disintermediation works for medium sized firms, too, such as Naked Wines, which uses an interesting crowd-funding and direct sales model — their “angel” investors finance wine production and become a built-in direct-to-consumer market for the final product — that’s double disintermediation in a way. My helpful reader drew my attention to a direct wine retailer called Fass Selections. which aims to cut out two links in the supply chain for their wines: importer and distributor. That’s disintermediation, all right! Disintermediation isn’t everywhere, but there’s a lot of it around (tasting rooms and cellar door sales? ), even in places you wouldn’t think to look. My favorite example of wine disintermediation was a discovery that Sue and I made while walking through the big Queen Victoria public market in Melbourne during our visit to Australia in September. I couldn’t believe my eyes when I saw the big stack of wine barrels at the ReWine market stall. The ReWine folks offer a carefully curated selection of wines that they have purchased in bulk from Australian producers. 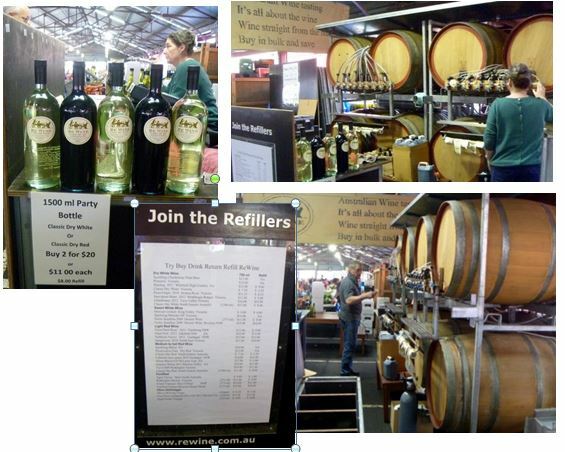 They sell them directly to consumers in the Queen Victoria and Preston markets — the bottles are filled from the barrel containers you see in the photos. Bring your bottle back to be refilled (like the wine “growlers” that are gaining popularity here in the U.S. where local law permits them) and you get a discount. The wines range from basic dry red and dry white wines sold at a low price to some very interesting products on up the line including dry, sweet and fortified wines. There was a nice Pinot Noir from the Adelaide Hills on offer when we stopped by. You get what you pay for in the basic range, we were told, as these wines are blends made for a particular price point like basic wines everywhere in the world, with more distinctive products at the higher price points. Something for everyone, I think especially for a wine economist like me! These examples just scratch the surface of disintermediation in the wine industry. I visited with a 2500 case winery recently that seemed to build its entire distribution model around the concept of cutting out the middleman. Easy to see the incentive to do this and also to appreciate the risks. Once you start to think about disintermediation you will begin to see it at work everyone, even in the world of wine. Keep your eyes open — it might not change everything, but it’s bound to have a big effect. Thanks to my economics-savvy reader for suggesting this topic. Thanks to Sue for the Melbourne photos.